Wire rods are normally rolled in a high speed rolling mill, where steel temperature is above 1,000 deg C, maximum speed of rolling exceeds 120 metres per second (m/s) and coils of wire rod produced can be upto 10 kilometers (km) long. During rolling of wire rods, usually 25 passes to 30 passes are taken in a continuous rolling mill. Wire rod is a material which has a very wide application. From components for the automotive industry, tire cord, electrodes, connecting elements such as nuts and bolts, springs, wire and wire products, steel reinforcements, and so on, everything is based on wire rod. That is why wire rod mill is normally designed with versatility in mind. The mill being an energy intensive mill, it becomes necessary that the optimum solutions are incorporated in the mill design without compromising on the flexibility. All size ranges, materials and alloys need to be produced efficiently and with high productivity in the wire rod mill. Wire rods are required to meet the wire rod users’ requirements of surface and internal quality as well as physical, chemical, mechanical, and metallurgical properties. Wire rods undergo post-processing such as drawing, forging, or machining into desired shapes and heat treatment for enabling the product to achieve the desired strength. Thus, the wire rods are required to be capable of ensuring good performance of the produced parts wherever they are used, and at the same time, to have good workability at different stages of the post-processing. The user of wire rods has three basic requirements namely (i) to eliminate or simplify one or more of the secondary or tertiary processing to improve productivity and reduce processing cost, (ii) to improve the functionality, i.e. to extend the service life, to reduce the weight, or to bring other advantages to the final product for which the wire rod is used, and (iii) to eliminate the use of environmentally harmful substances during post processing processes. For meeting the increasingly rigorous requirement of the consumer, the wire rod mill needs to have the overall capabilities of the rolling wire rods from the various standpoints namely (i) improving the dimensional accuracy, (ii) implementing size-free rolling (i.e., rolling products of varying sizes without changing rolls), (iii) improving the productivity by speeding up the roll-changing work (shortening the roll-changing time) and (iv) improving the product surface quality by preventing the occurrence of surface defects during transportation in the rolling process. Wire rod mill is supposed to supply not merely the materials, but it is to supply wire rods to meet the requirements for the long subsequent process­ing which they undergo in the secondary and tertiary processes until the final end products are produced. Furthermore, since the end products are used in many cases as vital parts in various industrial fields, there are requirements for process rationalization in integrated collaborations with customers. Hence, the mill is to be capable of not only to meet the quality requirements of the users but also to meet their productivity, yield, flexibility, and production cost requirements during the subsequent processing. A high mill yield along with the adequate product quality is of utmost importance for the control of the production cost. The production capacity of a wire rod mill is dependent on either volume production of a few standard products or having a diversified product mix consisting of wire rods with a large number of steel grades and specialized product qualities. A wire rod mill basically needs (i) heating facilities for heating the initial material (billet) to rolling temperatures, (ii) rolling facilities consisting of rolling stands with rolls, chocks, guides and guards, (iii) laying, heat treatment, and coiling equipment, and (iv) conveying and handling equipment. All the equipments are to work in close co-ordination with a control on rolling temperatures, gap time loss, speed loss, cobbles, non-conforming product, and quality deviations leading to diversion or even rejection. 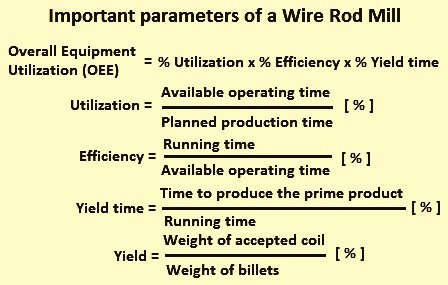 There are several important parameters (Fig 1) for rolling of wire rods in a wire rod mill. A modern wire rod mill is generally designed to work with ‘overall equipment effectiveness’ (OEE) philosophy. OEE value of the mill is the value obtained by multiplying mill utilization, mill efficiency and the mill yield time. The mill utilization is the available operating time divided by the planned production time and expressed in percentage. The mill efficiency is running time divided by the available operating time of the mill and expressed in percentage. The mill yield time is the time to produce the prime product related to the running time. Product yield is expressed as the weight of accepted coil divided by the weight of the billets and expressed in percentage. Wire rod mills normally have lower OEE than other kinds of mills because of the higher downtime for roll changing and stand changing and groove and guide adjustments during the shifting of the products. The OEE of the mill can be improved if this downtime can be reduced. The theoretical production capacity of a mill is the capacity which can be obtained without any losses i.e. with 100 % utilization, 100 % of efficiency, and 100 % of yield. However the actual capacity is dependent on the OEE level of the mill. If OEE level of the mill is 60 % then the mill production capacity of the mill is 60 % of the theoretical capacity. The OEE level in a state of art wire rod mill with a well-defined optimized mill is normally at the level of 80 %. The cost of poor quality in the wire rod mill is generally determined as the sum total of inspection cost, and rejections/diversions of wire rods due to the internal and external defects. For a high performing mill, it can be around 10 %. It can increased upto 30 % in a wire rod mill with a diversified product mix consisting of wire rods with a large number of grades and specialized product qualities. In a modern wire rod mill, the main focus is on productivity and quality. High utilization, efficiency and yield give high productivity. But high productivity itself is not the only thing for the success of a wire rod mill. It has to produce products which give value to the customers and they get the quality wire rods worthy of the payments which they are making for the wire rods. The productivity and utilization of the mill is dependent on the downtime in the mill caused by several reasons including the mill layout and the product mix. In the mill, the yield from billets to the final product is registered in all steps and the tracking of the material in the mill follows up the losses taking place in the mill. The major categories of the losses which take place in the mill are (i) gap time losses, (ii) speed losses, (iii) losses due to cobble, (iv) losses due to quality deviation, (v) losses due to mill down time, (vi) losses due to diversion/rejection of wire rods during inspection in the finishing side of the mill, and time losses due to value enhancing operations in case of production of specialized wire rod products. In a wire rod mill, steel (billet) is heated above its temperature of recrystallization and passed through several grooves of the rolls in the rolling mill. Common roll pass designs used in wire rod mills are diamond-square, diamond-diamond, box passes, square-oval, false round-oval, and round-oval. In the wire rod mills normally size free rolling is being done, which means wire rods of any size can be rolled without the limitations of the pass sizes of the rolls held in the mill. This is also being known as flexibility of the series. Furthermore, the simplification of the pass schedule of an upstream rolling mill enables the frequency of the roll changing to be substantially lowered. The wider the range of the product size capable of being rolled with the same rolls (size free range), the greater is the effect of reduced frequency of roll changing. The size free rolling is not limited to the finishing mill. It can also be applied to pre-finishing mill. For improving the productivity, there is a focus on minimizing the downtime of the wire rod mill. The effectiveness of such focus is usually enhanced by reducing the time and need for changing rolls when new final dimensions and new steel grades and shapes are to be manufactured. This is achieved by improving the working range, also named flexibility of the series. Improved flexibility is reached when large amount of different steel grades, with different shapes and dimensions are rolled with a minimum change of the rolling schedule. Every steel grade is characterized by its specific way of material flow, such as different spread, when passing through the roll gap. Also the start-up time and time waiting for correct rolling temperature, depending on the actual steel grade, need to be decreased. However different heating cycles still cause too high downtimes, when a wide range of grades is to be rolled. In order to meet the market demands of today, which include smaller lots and numerous kinds of steels, it has become a necessity that the modern wire rod mills show a high degree of flexibility. A special aspect in a wire rod mill is the use of a flexible roll pass design, or flexible groves with high working range. With the use of flexible roll pass sequences, the rolling can be carried out in the same grooves for a wide range of finished products, simply by changing the roll distance. Thus groove changing can be replaced by a simple shifting of the roll gap and this reduces the downtime for changing from one product to other. There is a strong inter-dependence between the flexibility of roll pass design, the mill utilization and the yield. By adopting a flexible roll pass design an important part of the losses in the mill can be reduced. A flexible roll pass design minimizes the risk of groove overfilling and creation of cobbles during the change of steel grade. A flexible roll pass design also has advantage for product development when there is a need to introduce new sizes or steel grades. Also, important improvement of the value enhancing running time can be achieved with a flexible roll pass design. The wire rod mill can be combined with a bar mill by having a cooling bed outlet before the finishing block. This is normally done to utilize the capacity of the upstream rolling mill. When the rolls are changed in the wire rod block, the upstream mill produces bars in order to reduce the total down time for the mill. Modern wire rod mills are generally single strand rolling mills. In case of a multi strand mill, a second intermediate rolling mill is introduced on each of the strands to re­duce the influence of change in the number of simultaneous rolling in strands. The second intermediate rolling mill can be in the form of a pre-finishing block. It also can be in the form of three-roll rolling mill block. The major feature of the three-roll rolling mill is its ability to suppress the variations of dimension between the three grooved rolls which roll the entire circumference of a rolled stock and thereby lessen the spread as compared to a conventional two-high rolling mill. This intermediate mill is known as sizing mill where the shaping is done by means of low reduction. This helps in having a family rolling philosophy upstream in the mill, thus reducing the resetting time. For increasing of the mill speed and hence the mill productivity, a reducing/sizing mill (RSM) is installed after a conventional finishing block. The integration of a RSM after the conventional finishing block improves mill productivity on small sizes substantially (by up to 60 %). Its extreme precision has been proven in many installations. Further, in combination with very low-temperature rolling, this results in a more refined microstructure which can eliminate additional secondary processes. The RSM provides both productivity, and finished product quality improvements, simultaneously reducing operating costs and increasing quality of wire rod product. It accommodates a single roll pass design from stand 1 in the roughing group through the last stand of the finishing block. Since it facilitates a same single-family pass design, high mill efficiency can be maintained without regards to the final product size. Inter-stand tensions are normally avoided as much as possible in the wire rod rolling since otherwise head and tail ends go out of tolerance because the free ends cannot be rolled under tension. This fact can result into overfilled grooves and end defects such as fins. However in the high speed no twist block with fixed transmission, inter stand tensions are used to achieve stable rolling conditions. When inter stand tensions are applied to the rolled bar, the groves are set to give the required tolerance. Wire rods are being used in several applications. In many of the applications, the quality requirements from the wire rods are very stringent. Inferior quality of the wire rods increases defects/diversions of the final products as well as it adversely affects the yields at the customers’ end which causes dissatisfaction in the customers. Since wire rod rolling is an energy extensive rolling, it is always necessary that the rolling of defective wire rod coils is reduced to minimum. Sometimes when the defect in the billet is quite big, it can even cause cobble in the mill. Since the length of wire rod from a billet is very long, quality assurance throughout the whole length of the wire rod after rolling requires time and efforts. For this reason, the quality control of billets (the starting material before rolling), is of great importance. The defective billets need to be identified, segregated, and removed by billet inspection. Billets are to be inspected both for the surface defects as well as internal defects. Minor surface defects can be removed by grinding (conditioning) of the billet. The important features demanded in the wire rods (especially in thin wire rods) are the high productivity in secondary working and high strength after final drawing. The high productivity means minimizing wire breakage during drawing and bunching or ideal no breakage, higher direct drawability, and good drawability under severe drawing condition such as high drawing speed. These increasingly sophisticated requirements of customers by applying stringent standards to quality control items such as non-metallic inclusions, segregation, decarburizing, mechanical properties and microstructure. etc., hence, requirements from the viewpoints of cost reduction, energy saving and environmental conservation strongly urge elimination or simplification of heat treatment and machining (such as near net or chip less shaping). Control of non-metallic inclusions, precipitates, transformation and metallographic structure is a key metallurgical measure for the property enhancement of the wire rods. The control of non-metallic inclusions is one of the main seed techniques for strength increase of spring steels, service-life extension of bearing steels, and elimination of lead from free-cutting steels, etc. Control of the structure and shape of oxides and sulphides is effective in realizing desired properties of these steels. In a wire rod mill, there is no compromising when it comes to meeting specified coil material properties with precision. This is where the controlled cooling conveyor (CCC) system plays a key role. The consistent high quality throughout the wire rod coil is required to be controlled. In this respect, the CCC system plays an important role for the processing quality wire rod products, achieving desired uniformity, and metallurgical and mechanical properties. It tightly controls the around-the-ring tensile strength variations on fast-cooled products to a standard deviation within 1 % of the average tensile strength. The CCC system by a proper selection of cooling regime accommodates production of all conventional grades of steel as well as special product grades with alternative cooling modes. It also optimizes processing of carbon and alloy steel grades when used in conjunction with the RSM for low-temperature rolling and controlled cooling, producing a very good combination of properties and dimensional control. The CCC system facilitates processing in a wide range of conditions, including both fast-cooling and slow-cooling modes within a single system. This capability enables the wire rod mill to produce a broad spectrum of plain carbon and alloy steels, as well as stainless steels and other specialty grades. The CCC system results in improved as-rolled rod properties of the wire rods, which enable the production of more grades in a directly usable condition, and reduce or eliminate downstream processes, such as, spheroidize annealing. Thermo mechanical rolling (TMR) in the wire rod mill refines the final grain size as a result of dynamic recrystallization. Combined with final in-line water cooling and the superior controlled cooling on CCC system, TMR plays a significant role in determining final product properties. This is particularly beneficial for low- alloyed and medium-alloyed steel products which are subsequently spheroidize-annealed during downstream processing. The ability to strongly control grain size also influences subsequent transformation to hard products such as bainite and martensite by shifting the transformation start time and temperature. Thus, TMR can minimize direct downstream cold working and reduce annealing times. The combination of processing on CCC system and low rolling temperatures provides the capability to reduce hardenability in some critical grades of wire rods. Ultimately this promotes ferrite formation and retards the evolution to bainite and martensite. The refined grain size achieved through TMR improves diffusion during heat-treating and can result in reduced heat treatment times and temperatures. For those rods which are not heat-treated, the refined and complex structures increase tensile pickup during cold deformation, producing several advantages such as (i) reduced as-rolled tensile strength, (ii) improved downstream response, and (iii) increased work hardenability. The improvements stem from grain refinement and microstructural control. The good control of the cooling process at the CCC system combined with the reduced hardenability of the wire rods makes the process very stable and reduces the chance of forming unwanted hard phases.